latest news - tour dates for North america, 2019. THURS 15 AUG –The Birchmere Music Hall, Alexandria VA.
ironbark 25th anniversary regional tour continues in 2018. Tour Dates Announced for September/ October, 2018. THURS 4 OCT – SOLD OUT - Hopgood Theatre, NOARLUNGA, SA. SUN 7 OCT – SOLD OUT - The Lighthouse Theatre, WARRNAMBOOL, VIC. TUES 9 OCT – SOLD OUT - Frankston Arts Centre, FRANKSTON, VIC. WED 10 OCT – Geelong Performing Arts Centre, GEELONG, VIC. THURS 11 OCT – SOLD OUT - Burrinja Cultural Centre, UPWEY, VIC. SAT 13 OCT – SOLD OUT - The Westernport Hotel, SAN REMO, VIC. SUN 14 OCT - SOLD OUT - The Westernport Hotel, SAN REMO, VIC. This March I am stepping out on my first solo tour. I want to play music. I love singing. I found a voice and a story that was part of a new narrative. This one didn’t come out of traveling as a young’en in a campervan. This narrative came from soulmates, fools gold and hands in the dirt. Cowboys, canyons & canned peaches - what it takes and what it gives. Not a new story - old as the hills for sure.. But new in the telling. So I’m buckets excited and part a ways nervous. The plan is to have fun and make good music. In the set I’ll be playing new songs from my forthcoming album, which will be coming forth later this year. Maybe a few of my Waify tunes that don’t often get played. So post me any requests & I’ll start rehearsing those. It’s called a Solo tour but I will be accompanied by two of the finest musicians I know. And Ben Franz ... well he’s always got my back…musically . Solid as. Fair warning guys - I get to play electric guitar louder than anyone else if I want to…my call . We’ve got a whole weekend of fabulous festivals on the tour. I felt honoured to have the Adelaide Festival book me early on , the Riverside Palais is the festival club and has some great acts performing. Tickets available through the Adelaide festival office. Peninsula Picnic in Victoria & Blue Mountains Folk Festival . If I had my selfish way it would be festivals the world over, all the time. I love dragging my kids through mud and sun to hear exotic and intoxicating sounds emanating from steaming tents you can’t get into . They love it too. (nod your head boys). Check out the tour dates, we got some cool little clubs and venues around the Sydney area and the famous Northcote Social Club in Melbourne. As well as some great venues in regional WA to take me down home. I’d love to hear you there or see your silhouettes swaying and swingin' with the masses. If you are up for a night of good honest & lil bit rockin' music - then come along. I’ll be there with bells on (& some other articles). It’ll be the feelgood show of the summer when two of Australia’s most beloved musical treasures, The Waifs and Kasey Chambers, team up for an incredibly special show under the stars at Pioneer Women’s Memorial, Kings Park & Botanic Garden, on Saturday, February 3, 2018, with some very special guests. It’s been a historic year for The Waifs. The band celebrated its 25th Anniversary with the release of their eighth album, Ironbark, which debuted at #1 on the ARIA Album Chart, their first release ever to do so. Ironbark featured a song for every year of The Waifs’ existence, taking in 22 new tracks and three re-imaginings of live favourites (1996’s Shiny Apple and Take It In, 2004’s Willow Tree). The chart success was the perfect launchpad for their 25th Anniversary Australian tour during the middle of the year, with more shows added in November due to popular demand. Kasey Chambers also topped the ARIA Album Chart in 2017, with her 11th LP, Dragonfly, becoming her fifth number #1 album release. Produced by Kasey’s brother Nash Chambers, the double album featured guest appearances from Paul Kelly, Ed Sheeran, Vika and Linda Bull, Keith Urban and Foy Vance and saw Kasey light up both cities and countryside with one of her most extensive national tours ever. 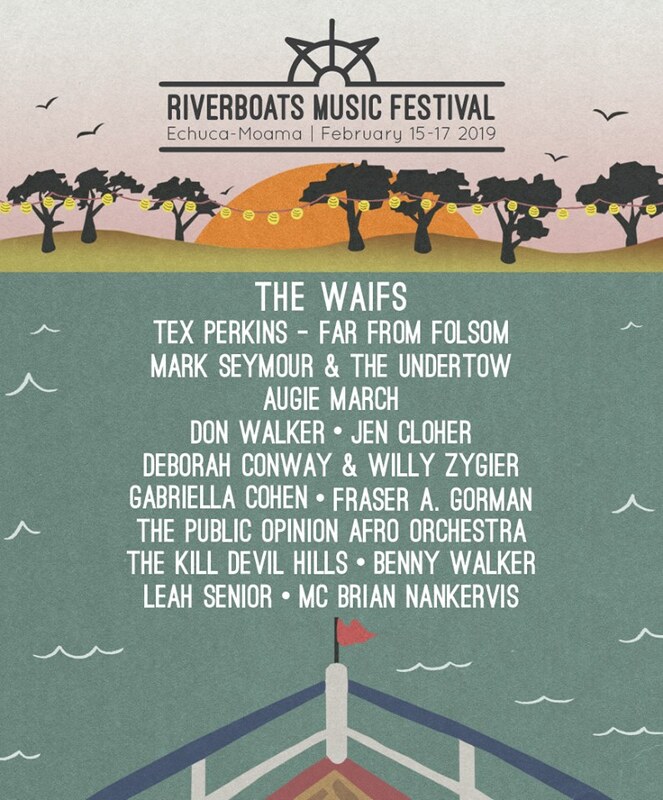 Acclaimed Australia singer/songwriter Lior also joins the line-up and is thrilled to help The Waifs celebrate their 25th anniversary in front of their home crowd. 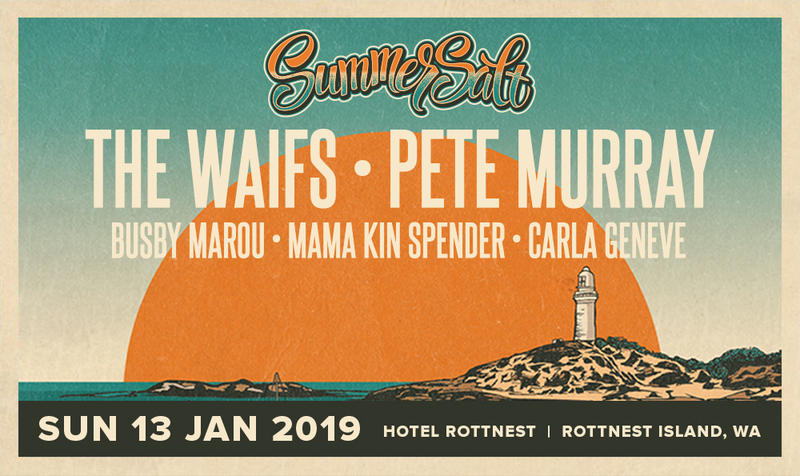 Lior is currently in the studio working on a new album but is excited about coming back to Perth for this one-off show and sharing a stage with The Waifs and Kasey Chambers. Rising talent, Stella Donnelly, has emerged as one of the bright new lights of Australian music in 2017. Her debut EP, Thrush Metal, caught us off-guard with its tender evocations and compelling messages all at once. Stella recently won the inaugural Levi’s Music Prize at the BIGSOUND conference in Brisbane and just this month received a J-Award nomination as well as winning an unprecedented five categories at the WAM (WA Music) Awards. This show is a fully licensed event. Minors (children under 18 years of age) may only attend the event if they are accompanied by their parent/step-parent or legal guardian. All patrons (including minors/babies) must have a valid ticket for entry. "They’re a treat to witness live, with every slide and percussive tap adding dexterous depth…young and old alike left smiling, knowing they were included, with hearts full of love." "It’s wonderful to see a band who have come so far down the road, with so much more left in the tank." The Waifs soared into 2017, celebrating their 25th Anniversary in style. Releasing their eighth studio record, completing a sold out national tour, gaining their first ARIA #1 debut and reminding fans that like a bottle of fine wine, they only get better with time. Earlier this year, they made a promise to regional fans that they would return in November to play intimate shows in their cosy towns....so here we are, with two sneaky, small city shows in Perth and Adelaide (with very limited tickets so get in fast). 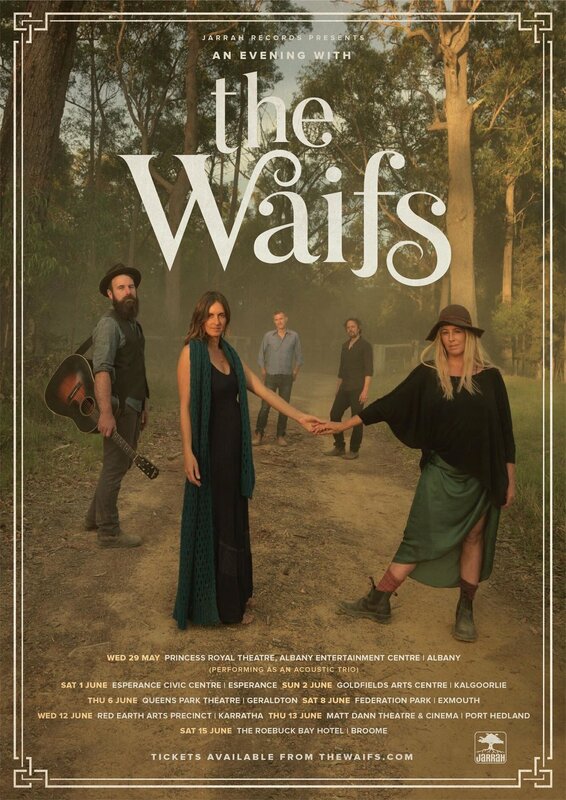 The Waifs have added a new South Australian date to the tour. Our 25th anniversary album "Ironbark" is out now Australia ; go buy it! It is our thank you to the fans for staying loyal to our band for the last 25 years. We are so appreciative of your support. 25 songs recorded in one fantastic session at Josh’s house in southern NSW. For the next 25 days you can buy it through thewaifs.com/store.html and it will only cost $6. This just covers postage and manufacture costs. Or you can go to your fave CD shop and it should be there for no more then $10. Or come to the show and buy a signed copy for $20. If you pre purchased the album it will already be in the post to you! Enjoy. Digital downloads will be sent by Hightail today ( Friday) so please look out for them in your email box. Get in quick , shows are starting to sell out. Quindanning Tavern and Bangalow Tues April 4 shows have sold out. And many of the venues are closing in on selling out. We have added a second Melbourne show on Wed March 29th which will feature Mick Thomas and the Resurrection( Mick from Weddings Parties Anything) . We have other wonderful supports around the country. you can check these out at the website. We have announced Kate Wolf Festival for the last weekend in June, in Laytonville, California. There will be more announcements soon! Thanks again for an amazing 25 years. Heres to the next 25! More Waifs news coming your way. It's download Tuesday as well as announcing our special guests for the anniversary OZ tour ! Today's Waifs song from Disc 2 of Ironbark is called Take Me To Town written by Vikki Thorn.Head to http://www.thewaifs.com/store.html to get your mitts on it! We are thrilled to announce all special guests , apart from Alice Springs and Broome. Nearly of these wonderful musicians have played with The Waifs somewhere in their 25 years on the road and we are honoured to share a stage again with them on this Australian tour. 2017 marks The Waifs 25th Anniversary. We are celebrating and commemorating this event by releasing 25 songs recorded live & acoustic at Josh’s beautiful house in the bushland of South Coast NSW, Australia. You had a say in all this! We asked ourselves what do our fans want to hear? Over the years we have experimented with songs and instrumentation in the studio. This time, to really capture the essence of our music and the essence of who we are today as artists, we decided to sit around a couple of mics with our guitars, a makeshift junk kit & a double bass, press record and play. So this one is for you guys. A makeshift studio was set up (with audio engineer James Newhouse) in Josh’s unfinished kitchen. Initially it was going to be some covers and acoustic versions of old favorites. But the songs kept flowing. We recorded 30 songs in 2 weeks and didn’t even get to the covers. There are very few about Homesick and Highways! Playing new songs completely live was exhilarating and sometimes exhausting. Some of the takes that made it on the album are the 3rd or 4th time we have ever played the song and it sounds like a band listening closely to each other, musicians that have been playing together for a long time. Huge love, thanks & credit to Dave (Ross Macdonald) and Ben (Franz) for holding the songs down again & again while we read lyrics from our tablets and came up with three different versions of everything. If we are the bread & butter these guys are the raspberry jam sweetening it up, making it extra tasty and bringing the sounds together. Some of my favorite moments in the studio are when Josh, Dave and Ben start jamming. (A PUN!) James Newhouse was amazing to work with and helped with everything from harmonies, to getting the best sound out of that old suitcase and taming the reverb of a live band in a kitchen. We were fortunate to have Tamara Dean (http://www.tamaradean.com.au) come to stay & take stunning photos for the artwork around the property. We’d get back in a leech infested dam for you any day Tamara. Thank you. The album is called IRONBARK referencing the majestic eucalyptus standing sentinel over us and the resilience and inner strength of the wood as opined in the song of the same title. at a very discounted price via the Website. You can preorder from this Thursday Jan 12th. as free downloads on the website starting with Josh’s “Song For Jacqueline” today. CD’s will be sent out physically on March 1st for delivery on March 3rd, day or release. Digital download codes will be sent out on March 3rd. We will be touring extensively in Australia in March & April and if we miss your town this time around we’ll be back in November & December to do it all again. We will be offering a very special Ticket/CD bundle for as many venues as possible. Check out the website today for more details. Ticket/ CD Bundle will be available as a presale to you the fans from this Thursday Jan 12th. We will also be visiting some favorite festivals and towns in North America in the summer. The Waifs fans are legendary in the industry for their loyalty and enthusiasm. It feels as if we have grown up together. We are now the band you can bring your parents AND your kids to hear! Your involvement in our career means everything to us. You are the very reason we are still playing music together 25 years on. You know all about us… meeting in Broome, West Australia, traveling around - that old tale has been told many times. SO, WE WANT TO HEAR YOUR STORIES.. If our music has played a significant part in any event or time in your life we’d love to hear about it. Send us an email to; Waifsstories@jarrahrecords.com AND post them on our Facebook. We would like to share some of your stories onstage, play some songs and weave it all together and celebrate. The Waifs are pleased to be celebrating our 25th anniversary and Womadelaide's 25th anniversary this year. Final line-up has just been announced. The Waifs jumped in a campervan in the early-‘90s and left their hometown of Albany, Western Australia for a life on the road. For years they trekked around the world playing to adoring audiences wherever they could. This Wednesday, Double J is bringing you a special Ausmusic Month program, The Songs of Your Streets. Hosted by Jacinta Parsons, the program will celebrate how place has influenced the lives and the music of one of Australia’s most celebrated bands. Join the live studio audience as we jump in the campervan and travel with The Waifs to hear a great yarn and some live songs and explore the places that have been important to them. 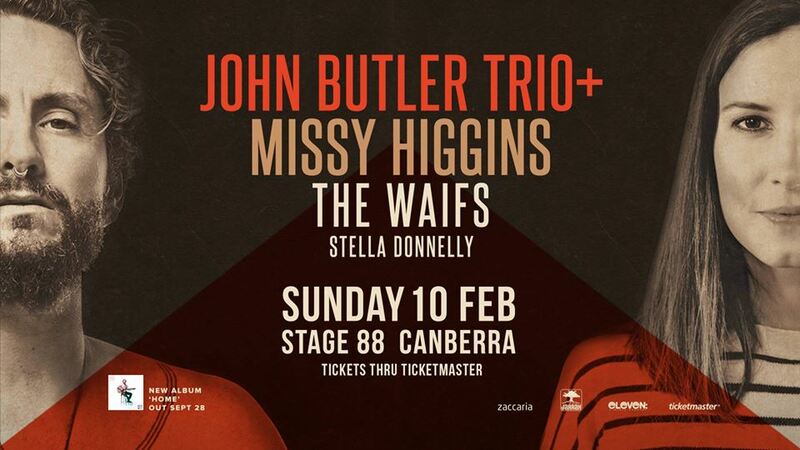 Double J presents Songs of Your Streets with The Waifs, an AusMusic Month special. Join us Wednesday 9 November from 7pm AEDT. Listen online, on your digital radio, phone or TV. The Waifs have just been announced to play 2017's Womadelaide Festival on 11th March 2017. One of Australia's iconic festivals, WOMADelaide presents four days of the world's best artists, thinkers, dancers and creators in a celebration of music, tolerance, goodwill, cultural curiosity and joy amongst the green oasis of Adelaide's majestic Botanic Park. We are really looking forward to playing at LostLands Festival at the Werribee Mansions, just outside of Melbourne, on Saturday October 29th. It's a new style festival with a strong focus on family. As well as being an amazing festival for adults, The Lost Lands is a great event for kids. During pre-sale when you purchase an adult ticket (1 or 2 day) you get a child's ticket for free! Take your own kids, and if you don't have any, give the tickets to a friend who does. Buy purchasing during the pre-sale period you automatically go in the draw for a complimentary room night at The Werribee Mansion. This is an amazing way to spend a weekend at the festival. During pre-sale get access to a very limited number of rooms at the Werribee Mansion. The room price includes Two Adult Tickets to the festival. These are not to be missed and are an incredible way to spend a weekend at the Festival. Everything was going pretty well for The Waifs up to 2003. They had sustained life as a band for over a decade and built up solid followings both at home and overseas. They drew decent crowds to their own shows and dazzled crowds at festivals as big as Bluesfest and the Newport Folk Festival. But then, in 2003, they released Up All Night. Everything changed. The album went double platinum. It was nominated for ten ARIA awards and won four of them. "London Still" was voted number three in the Hottest 100 and quickly went on to become an anthem for Aussie expats and backpackers everywhere. But there's so much more to The Waifs than that. Across seven records and hundreds of live shows, this band has touched so many people and continues to do so. Sarah Howells looks back at the entire career of The Waifs on The J Files from 8pm AEST on Thursday 5 May. Hi to old friends and music lovers ! It’s been a long while since The Waifs did an extensive USA tour so we are excited to announce this coming April/May tour . Starting at the "Festival International De Louisiane" next weekend. We have great memories of this free festival celebrating everything French & more. The first time we walked on stage there was a sign stating LE WAIFS-PARIS. That's Paris, Australia, of course. If you’ve been looking for an excuse to escape the northern spring we highly recommend flying into this free festival to spend a weekend steeped in cajun culture. I can taste the crawfish & beer as I write. Then we head over to Nashville on Sunday Night for a City Winery Show and we’ll be recording a Daytrotter session on Monday, I’m looking forward to getting into a Nashville studio again cause I’ve written a few country songs since I’ve been out here on the farm. (no tractors or ford trucks I promise) Will post details about where you can hear that. Nashville …next stop Chicago. What a life ! I’m getting sweaty palms just writing about it. We are performing at fantastic venues on the east side…Birchmere VA, Rams Head Annapolis, the Ironhorse in Northhampton and many more, before we head west to Boulder Theatre, CO. Following that my hometown of Salt Lake City at The State Room, before finishing up in Bremerton Washington and the famous Freight and Salvage in Berkley. We have a few more albums out since you saw us last and we are gearing up for our 25th anniversary next year with a new release and lots of touring. Thanks to our wonderful Agent Anne Marie Martins At SRO artists, everyone at Compass Records in Nashville. We feel blessed to be writing & performing after so long, we love what we do and are fortunate to be working with such wonderful people who are music lovers & continue to devote their lives to promoting independent artists. And to all of you who lend theirs ears. Who turn off the screens and enter the dark theaters of life to get lost for a short while in other peoples stories . We thank you and we’ll see you there. The fame haired rocking Miss Ruby Boots will be opening the shows with Mr Ben Franz on the lap steel . - See her link below. The Waifs are pleased to announce 3 new dates appearing at City Winery in Nashville 24th April, Chicago 26th April and New York May 3rd. These shows will be supported by the lovely Ruby Boots. Tickets available now on our Tour page. Australia day Jan 26th HOBART!! Our last show sold out in just a couple of weeks. We are thrilled to be coming back to Costa Hall to play with our label mates John Butler Trio on Thursday Jan 28th. More shows announced next Tuesday for OZ. THE WAIFS have a new album coming out this week, titled "Beautiful You”. You can listen to new tracks & check out the little video Vikki made for her new song "Black Dirt Track”. It was recorded back in Jan 2015 in Byron Bay. Then we’ll cover as much of the rest of Australia in October & November. Due to family commitments there are always a few places that we don’t make it to. Don’t take it personally if your town didn’t make it on the schedule this time we’ll come back around. We always do ! The Waifs are excited to be touring in North America again. With a new album due out later this year we are hitting the west coast next week with a run of festivals and theatre dates, including a gig in Vancouver as part of the Jazz Festival. And we’ll be back for more in August. Check our Facebook or website for details. This will be our first tour in the North America in 4 years ! Looking forward to seeing you all again.